The U.S. House of Representatives History, Art, & Archives websites provides a wealth of information for anyone researching its history (or any U.S. Representative). The site is a collaborative project between the Office of the Historian and the Clerk of the House’s Office of Art and Archives. It contains a wide variety of information (beyond what is provided by the Biographical Directory of the U.S. Congress) organized by the following headers: Institution, People, Exhibitions & Publications, Collection, Oral History, Education, and Records & Research. 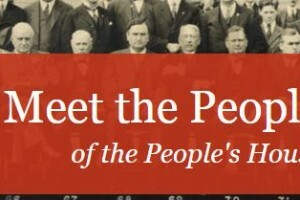 History, Art, & Archives explains the role and formation of the U.S. House of Representatives. The site provides an overview of how U.S. Representatives are elected, how districts are formed, and even includes a helpful glossary explaining certain terms frequently used by House members. 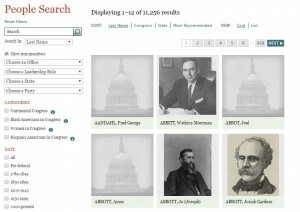 For more in-depth research, the website includes biographies of House members. Researchers can browse searchable profiles and historic lists to discover more about the nearly 11,000 individuals elected to the House—as well as information on the officials who have served the institution (see image below for example). If you are looking for photographs, manuscripts, or oral histories from a U.S. Representative, then the U.S. House of Representatives History, Art & Archives is the place to begin your research. Additionally, the site includes educational resources, links to primary and secondary source material, electoral statistics, digital collections, history of minority representation, and historical highlights, firsts, and milestones. You can also track the history of the House geospatially through their interactive map. Browse its collections. Access historical data and other research resources.